I will be in Utö-island for 10 days. 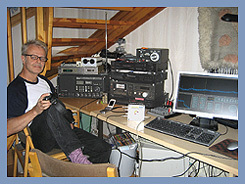 There is a group of 7 DXers monitoring the FM-band. You can read daily our logs from www.uto-fmdx.blogspot.com. Incredible start for this FM-season!! Here is SW Finland, and in whole Finland, Sporadic E-season has been exceptionally good!! We have had Band II opened almost everyday since 25th May till Sunday 6th June 2010 - and still continuing. Unfortunately I've no chance to tune all the best moments. Turkey, Greece, France (Paris), Benelux, UK (many pirates logged), Hungary up to 108 MHz for the whole evening till late night! Russia, Austria, Slovenia, Czech, Slovak, Croatia, Italy. MUF up to 108 MHz totally 7 hours! France, Germany, Italy around midday 45 min. Weakly in the evening. Greece, Romania, Turkey, UK, France (Paris open 108 MHz long time). Many hours. Weak Ukraina, Romania and Bulgaria for many hours. 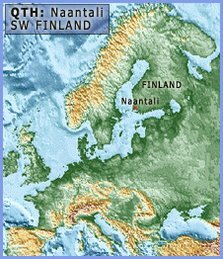 In East Finland DXers reached Middle East on FM. First time Iraq was heard - even one or two private commercial stations!! Also Iran, Syria and Saudi Arabia. Turkey was open to Istanbul for 1,5h to 108 MHz around Helsinki! For some reason Middle East is very rare here in West Finland. Very curious to see what is coming because the best time of the FM-season is ahead! !